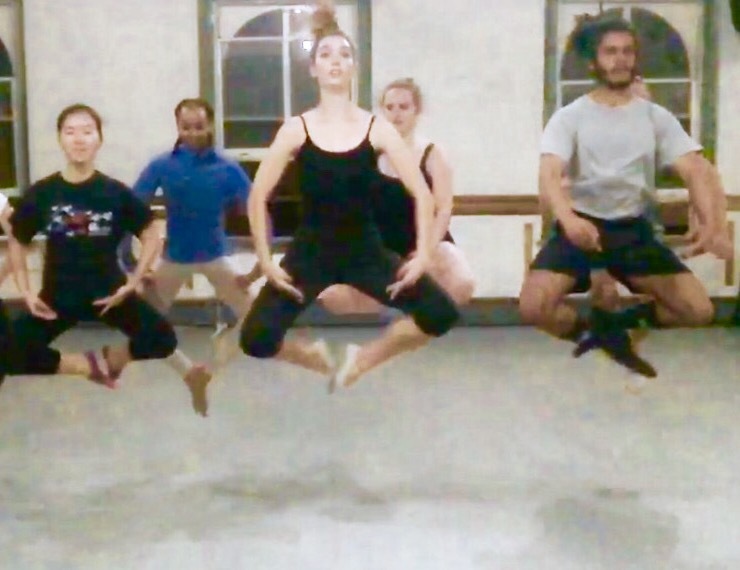 When dancers jump they invoke a quality that tricks the eyes. It’s as if they hang in the air, suspended for a moment, defying gravity before returning to earth. In ballet, that is an actual ‘thing’ and in French, that virtue is called ‘ballon’, which means to bounce or literally “like a ball”. If you’ve ever bounced a ball, you might recall that feeling when the ball rebounds back up into your hand, nestling there for a moment before you give it another push. That same element happens when dancers jump. To me it feels fun, like soaring or bounding while sailing through the air. Here are some tips to help you get that same feeling of ballon. 1. Technically speaking, achieving height and the maximum air-hovering time in a jump takes three things happening in quick succession. Your preparation is a demi plié. You must go down to go up–and yet you don’t necessarily need your deepest plié. Most importantly, be sure your heels stay on the ground and that you are descending straight down in your plié, not pitching forward. This can happen if your tailbone is not pointing towards the floor in your plié. Read more about pliés here. Bending forward in your preparation before a jump can cause your body to arch back at the top. If you can go straight down and jump straight up, you’ll get more height and maintain more control of your body while jumping. Doing sautés without pitching front or back involves using your legs to jump instead of your upper back. One exercise to help this is to try doing changements with your arms crossed over your chest and your hands holding onto opposite shoulders. It’s much harder to splay your ribs in this position and you may feel it in your legs more when you take off. 2. When you push off the ground, actively press your foot into the floor heel-ball-toe. That added flick of pushing off the floor with your feet and toes into a pointed foot position will give you an added boost. This is why you need to be sure you don’t lift your heels in your plié, so you have use of your full foot against the floor. It is also one reason to get your heels down in between jumps. If you don’t put your heels down when landing, you will shorten your Achilles’ tendon over time, which can lead to injury. Using your feet as you leave the floor has the added benefit of giving you lovely pointed feet in the air! One way to drill this action is to practice pushing one foot at a time into the floor without jumping. Start in first position, press the ball of one foot into the floor lifting your heel, then flick your toes pointed, launching your toes off the floor. Then “land” your foot gently back on the floor starting with the toe, then ball, and finally your heel, back to first position. Landing through your feet like this will soften your landing. Once you’ve done a few of these ball-flick-/-toe-ball-heels on one side, switch feet. 3. The third thing that needs to happen – at the same time really – is to push. Imagine for a second that you are in a swimming pool. If you were to push away from the side of the pool, the extension of your legs as you shoved off would propel your body through the water. The same thing happens in the air. Push against the floor and straighten your legs to help launch yourself skywards. Some cross training with squats and lunges may help build strength in your legs. As you can see, I could be bending both my front and back legs just a little more – I’m a work in progress! Jump straight up and land back in the same bent knee position. Try a few of these with the right legs front and then with the left leg front. You can also jump and switch legs in the air landing with the opposite leg forward. These split squat jumps will burn but they’ll make your legs feel super powerful and make ballet jumps feel easy in comparison. Jumps often require straight legs in the air, but in the photo above, the dancers are purposely bending their knees to execute a changement in the ceccheti style, where the knees are bent and the ankles are crossed in the air. Whether you straighten your legs in the air or not, you absolutely MUST plié when you land! Finally, visualization is a tool that can really help all aspects of your ballet technique. When you jump, imagine one of those super bouncy rubber balls. Jump as high as you can, and try to stay up in the air as long as you can, rebounding off the floor. I always tell my students, it feels so amazing to jump that way – it really is the best way to get high. Next week, Tuesday September 12th – one time only – class will be held at at Manhattan Youth Ballet at 248 West 60th street, Studio 4. Class will be an hour and a half in length for a $10 suggested donation. Take the ABCD or 1 train to Columbus Circle or the NW train to 57th street. See you at the barre!